When discussing beer with my fellow beer geeks, time and time again Guinness Draught comes up as part of the genesis of their love of beer. It's usually a pint of Guinness that helped them realize there is more to the world of beer than soulless, fizzy yellow clones. They might have even gone as far as ending up a full-fledged brand evangelist, proudly telling anyone within in earshot that Guinness is the manliest beer ever produced and the only brand that matters. Inevitably, they end up working their way up the craft-beer ladder, perhaps chuckling a bit when they look back at the old days. Tellingly though, they still love a pint of Guinness–at least every now and then. 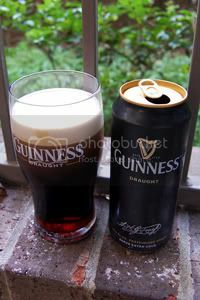 Not just for old time's sake, but because Guinness is just an enjoyable beer. This is all what happened to me, I'm the cliche. I enjoyed my first pint of Guinness in a faux Irish pub here in Houston one night and a light just went off above my head. From that moment, beer was not just something to get you drunk, it was so much more. Soon, I was one of those "Guinness people" telling Bud Light drinkers off at every chance I had. I ended up with bottle openers, endless numbers of pint glasses, a real deal neon light, a closest full of Guinness shirts and sandals, and even a mini-fridge (now used as a rudimentary cellar). And though Guinness doesn't mean everything to me that it used to, I have no regrets–it helped make me the beer advocate I am today. Appearance: Guinness Draught is truly a beautiful thing. Perhaps the prettiest glass of beer I have ever seen, a tulip-shaped pint glass filled with a properly pulled Guinness Draught is as iconic as it gets. It's dark reddish-brown (not quite black), pierced by laser beams of red light, and capped by a creamy tan head. And my god, the bubbles–I could get lost watching the head settle on a pint, it's simply hypnotic. Aroma: Chocolaty, roasty, and slightly sour malt with a little dark fruit thrown in. It's lacking a bit in intensity, but some of that's probably due to the dense nature of the nitro-head. Taste: Quite similar to what the nose promised: mild milk chocolate, weak coffee, dark fruit, and sour roasted malt predominate, with a little light bitterness thrown in to help balance everything. There's some metallic iron-like flavors from time to time, but they don't ruin everything. It's not a particularly intense as far as flavor goes, but it gets the job done as a session brew. The aftertaste is roasted malt with mild bitterness. Mouthfeel: A creamy as hell and amazingly silky medium-light body with smooth carbonation to match. Dries out in the finish. Drinkability: While it's not exactly my first choice for a hot Summer's day, Guinness is still an amazingly drinkable beer. Verdict: Chances are, if you're reading this you know exactly what it's like to have a pint of Guinness Draught. Inoffensive and generally uninteresting, yet highly recognizable and iconic, it's quite the paradox. Just the kind of paradox that's perfect to ponder over a familiar pint.